I can't install win 7 on my brother's laptop. error 0x80070570, file missing or corrupted. I've seek solution on the net but nothing seems to work. Try another flash stick or DVD using the ISO and tool to burn to disk/stick in Clean Reinstall - Factory OEM Windows 7 which steps will assure you get and keep a perfect install. Since Acer Recovery will not run after a Clean Reinstall to C, delete all partitions during the booted install. If this fails work through these steps for Overcoming Windows 7 Installation Failures - Windows 7 Help Forums reporting back any failure by when it happened and any error or other behavior. If these fail test your hard drive using the maker's HD Diagnostic extended CD scan, followed by another Disk Check run from installer's Command Line on the full disk partition you created. Maybe try and install Windows on a GPT formatted HDD? No, you have a corrupted disc, as Greg stated, download a fresh iso file and burn to dvd and try again. Please explain in detail. Do you mean bad sectors ?. How did you tested HDD and what do you meant by "quarantine" ?. To properly test a had drive, you should use manufacturer's diagnostic tool. I prefer to use "Seagate Tool" as it is the best in detecting HDD failures in my personal experience. It also supports testing all manufacturer's disks. 1. Download "Seatool fo DOS" from the below link and burn it to a blank CD. 2. Set the SATA mode to IDE emulation in the BIOS of the laptop. Usually it will be set to AHCI which is not compatible with DOS tools. 3. Boot from the disc and run a "Long Test". Please report whether the test is a PASS o FAIL. 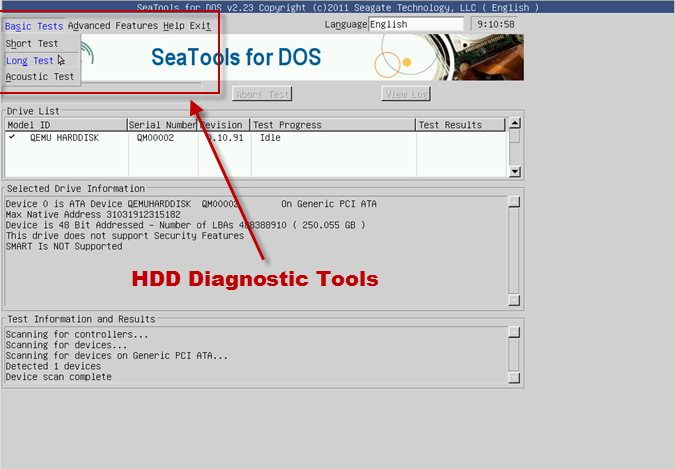 Alternatively you can connect the disk as a slave dive on the Desktop ( connect directly to a unused SATA port ) and use "Seatools for Windows" to test it. Select the slave disk in question for diagnostics and execute "Basic Tests --> Long Generic".